Join the discussion on our forums! Come discuss Sunreaver Spy over in our dedicated Sunreaver Spy discussion topic. Battlecry: If you control a Secret, gain +1/+1. 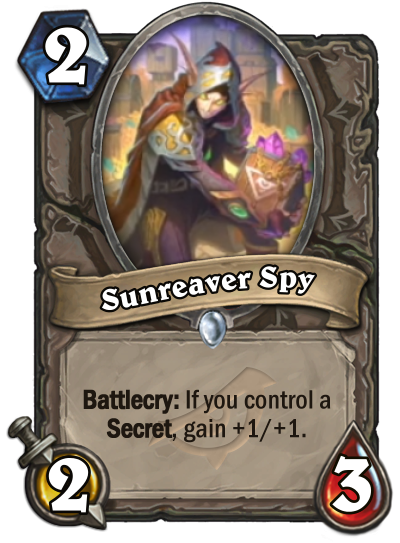 I feel like this cards is too strong, the thing that they should have done is maybe be a 1/2 card and if you have a secret gain 2/2 sounds more fair to me. If any card will get Secret Paladin to Tier 1 it's this one. I am calling it now, this card will be propably the strongest of the set! Wow, Secret Pally gets a Totem Golem and a Fiery War Axe. Should be a fun expansion.